The old set up still exposed workers to soldering fumes. 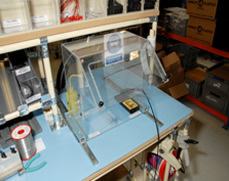 KAC alarms used capturing type LEV to control exposure to soldering fume. 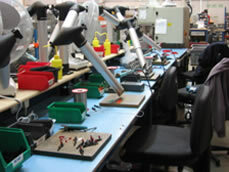 When a member of staff was diagnosed with occupational asthma, the company realised it needed to improve LEV control. KAC took LEV design advice. Staff were involved in the design process and two prototype LEV enclosing hoods were produced to try out. One enclosing hood design was fixed; the other could slide backwards and forwards (allowing use of a powered screw-driver). Staff gave the company suggestions for improving the prototypes and at the same time, work-station designs were optimised for comfort and more productivity. The new LEV hoods cut exposure to solder fumes by 98%. Since the new LEV hoods have been fitted, exposure to solder fume has fallen by 98%. With solder fume exposure now reduced, a potentially serious health risk has been controlled. KAC replaced all of the old hoods with the new designs. The original fan and filters were used. The only costs were the new hoods; fixed = £140 and movable = £180. Big increases in the effectiveness of LEV control can be achieved by maximising process enclosure. Relatively small LEV design changes can often dramatically increase control effectiveness at relatively low cost. Involving the workforce means that any changes are designed with their input and needs in mind and are more readily accepted.